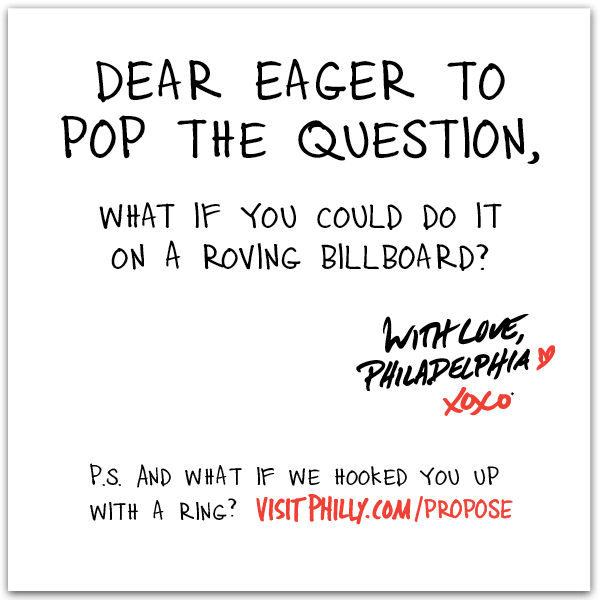 Philly, one of my favorite cities in the world is going to help one lucky guy (or gal) propose to their unsuspecting significant other this Valentine’s Day. “Tell us about Philadelphia’s role in your love story. Once we select a lucky man (or woman) on or about February 4, we’ll work with him or her to craft a Valentine’s Day proposal scenario involving a personalized proposal letter that will appear on the side of a Philadelphia Trolley Works trolley. You’ll also work with Bernie Robbins to secure your Hearts on Fire Acclaim ring. Click here to enter and read the official contest rules. An engagement is one of those things that you’ll remember and talk about for the rest of your life; where you were, who was there, how s/he proposed, etc. This contest is a chance to turn current residents or frequent visitors into evangelists for the city of Philadelphia. So it makes total sense for this to be sponsored by the city’s tourism office because they can showcase the best that the city has to offer; from the chosen destination to the city’s hospitality (Hotel Monaco), attractions (Philadelphia Trolly Works Trolley) and even local businesses (Bernie Robbins Jewelers). And, over the last few years, proposals have become huge productions, with many of them going viral and landing a few lucky couples on national morning shows such as The Today Show where they have the potential to attract an even bigger audience. So, if the winner of this contest comes up with a clever proposal idea and it goes viral, it could be a huge PR coup for Philly tourism and their brand partners. Win/win situation for all involved.